Are you worried your smile is not as bright as it could be? Let’s face it… most of us are coffee or tea drinkers, and many of us enjoy the occasional glass of red wine. Those things (although they are wonderful) can lead to stained or discolored teeth. The good news is, we can easily fix that problem! 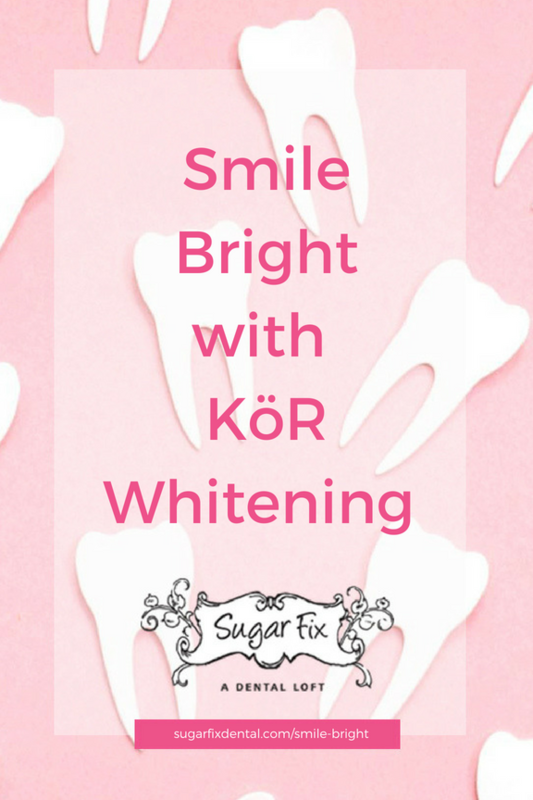 At Sugar Fix Dental, we absolutely love the KöR Whitening Deep Bleaching™ system! It helps us transform our patient’s smiles safely and without sensitivity in just two weeks. At Sugar Fix Dental Loft, we offer a few different whitening treatment options, but the KöR system is our most sophisticated. This is a two-week system that you do at home using custom trays that we create for you in our office. Because the trays are perfectly molded to your teeth (unlike the ones you can get at the store), the product is able to saturate all the surfaces of your teeth and create a consistently brilliant white smile! Once the molds are created, the product is shipped to your home overnight on dry ice, which keeps everything fresh. Shelf-stable formulas that are sold in the stores often break down and become less effective over time. Even more concerning, they can cause increased tooth sensitivity. The KöR Whitening Deep Bleaching™ System works by first restoring your teeth’s ability to absorb oxygen. Then, the oxygen from the whitening gel gets absorbed deeply into the tooth, dissolving stain molecules. You’ll wear the trays for two weeks while you sleep and at the end of the two weeks, you’ll stop in and see us one last time and then you’re good to go! KöR Whitening is one of the most powerful whitening products out there. If you haven’t seen results from store-bought whiteners or other in-office techniques, there’s a good chance KöR can do the job for you. So many times, patients think their situation is hopeless, or they think they need veneers in order to get a truly white smile. I love showing people how effective KöR is and giving them another option to consider. We also love it because it doesn’t prevent you from enjoying the things you enjoy most, like your morning latte or a glass of merlot. These are the simple pleasures that make life wonderful! We want to help you enjoy them with confidence, without having to worry about stains or sensitivity. Want to see what Dr. Emery and the team at Sugar Fix Dental Loft can do for you? Request an appointment or get more information about the KöR Whitening Deep Bleaching™ System by clicking this link. We also offer a wide range of other aesthetic dental services such as veneers, Invisalign, and same day crowns.